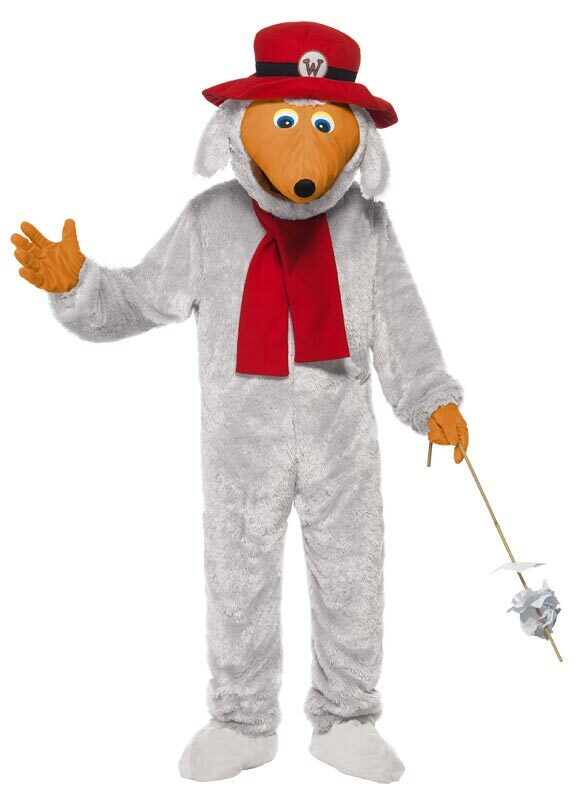 A new Orinoco costume (for adults) is now on sale, produced by licensed fancy dress experts Smiffy’s. It complements their earlier Great Uncle Bulgaria costume, but the Orinoco version has a padded face that looks much more convincing. The costume comes in a soft plastic case measuring around 40 x 28 x 40 cm. It’s made up of a grey fur bodysuit, a big padded head, a red felt scarf and a pair of orange gloves. It’s sold as a size medium (chest 38-40″, waist 32-34″) but the body is quite generous, with plenty of room to stuff in some cushions for Orinoco’s fat tummy. I found it a bit baggy in the crotch, so it wouldn’t be ideal for running unless you’re quite tall or you wear shorts on the outside to hold it up. The bodysuit zips up at the back. The built-in feet are designed to cover your shoes, with no soles but Velcro straps underneath. The headpiece fits over your head, with a hole at the front so that your face looks out underneath Orinoco’s face. With your head tilted slightly forwards, people will see Orinoco; with your head up high, they can see who’s inside. This is fine for fancy dress parties where you’ll want to eat, drink and talk, whereas the Wombles costumes for hire have a fully enclosed mask with eye holes so children won’t catch sight of a human face. The padded head, with its attached red hat, adds about 30cm to your height. It’s quite snug so I wouldn’t fancy wearing it for a very long time. There’s a strip of fur at the neck, and Orinoco’s scarf helps to conceal the join in the costume. Finally, add the orange gloves/hands to match the face, and any accessories of your own, like a tidy bag (or some food). The costume is generally well made, though mine has a couple of flaws: some damaged fur patches on one sleeve, and a few centimetres of missing stitching where the zip comes away from the fabric. Hi Tara. Great review. Out of interest… what is the copyright statement on the costume- does it refer to Elisabeth Beresford/FilmFair and/or anyone else? Thanks!